How to connect the speakers? 2. Insert the black wire into the black terminal (–) and the red wire into the red terminal (+), and then release the tab. 3. Connect the other end of the speaker cable to the connecting jacks on the back of the Home Theater and Wireless Receiving Module. • Make sure the colors of the connecting plugs match the connecting jacks. • Do not let children play with or near the speakers. They could get hurt if the speaker falls. 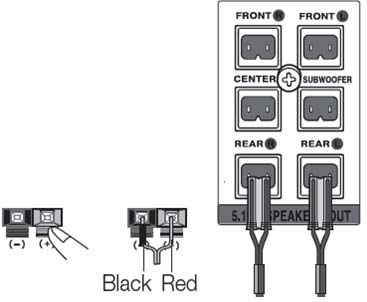 • When connecting the speaker wires to the speakers, make sure that the polarity (+/ –) is correct. • Keep the subwoofer speaker out of the reach of children so as to prevent them from inserting their hands or alien substances into the duct (hole) of the subwoofer speaker. • If you place a speaker near your TV set, screen color may be distorted because of the magnetic field generated by the speaker. If this occurs, place the speaker away from your TV set. 1. Connect the front, Center and Subwoofer speakers to the DVD Player. 2. With the DVD Player turned off, insert the TX card into the TX Card Connection (WIRELESS) on the back of the main unit. • Hold the TX card so that the slanted side faces to the left and insert the card into the port. • The TX card enables communication between the main unit and the wireless receiver. 3. 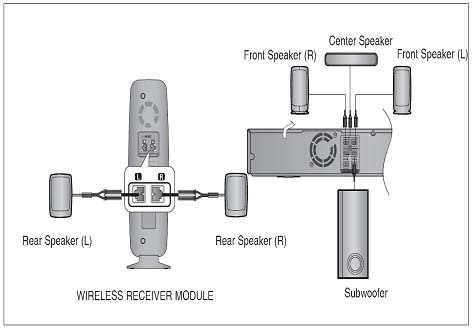 Connect the left and right rear speakers to the wireless receiving module. 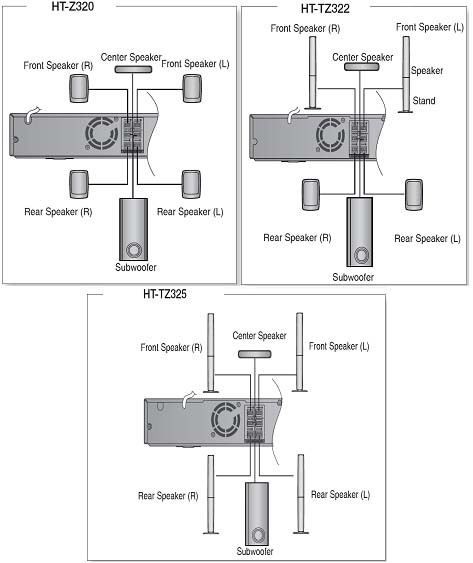 • HT-Z420/TZ422/TZ425 doesn’t have rear speaker connectors on the main unit. The rear speakers are connected to the Wireless module. 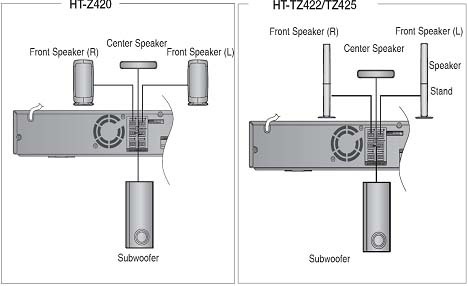 • The rear speakers for HT-Z320/TZ322/TZ325 can also be connected to the Wireless module (SWA-4100) if you purchase it separately. 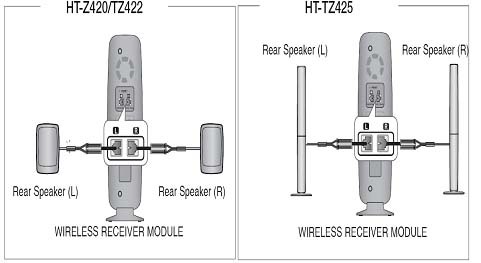 The HT-Z420/TZ422/TZ425 only can connect with wireless receiving module (SWA-4100). • Place the wireless receiver module at the rear of the listening position. If the wireless receiver module is too close to the main unit, some sound interruption may be heard due to interference. • If you use a device such as a microwave oven, wireless LAN Card, Bluetooth equipment, or any other device that uses the same frequency (2.4GHz) near the system, some sound interruption may be heard due to interference. • The transmission range from the main unit to the wireless receiving module is about 33 feet (10m), but may vary depending on your operating environment. If a steel-concrete wall or metallic wall is between the main unit and the wireless receiver module, the system may not operate at all, because the radio wave cannot penetrate metal. • If the main unit doesn't make wireless connection, the system needs ID Setting between main unit and wireless receiver module. With the main unit turned off, press the remote control's number button buttons "0" "1" "3" "5" and the main unit will turn on. With the wireless receiver module turned on, press "ID SET" button on the back of the unit for 5 seconds. • Do not insert any other card except the provided TX card. If a different TX card is used, the product may be damaged or the card may not be removed easily. • Insert the TX card when the DVD Player is turned off. Inserting the card when it is turned on may cause a problem. • If the TX Card is inserted and wireless receiving module setting is complete, sound is not output from the Rear Speaker connectors on the main unit. • The wireless receiving antenna is built into the wireless receiver module. Keep the unit away from water and moisture. • For optimal listening performance, make sure that the area around the wireless receiver module location is clear of any obstructions. • If no sound is heard from the wireless rear speakers, switch the mode to DVD 5.1 channel or Dolby ProLogic II . How to set up AV SYNC in Audio setting?